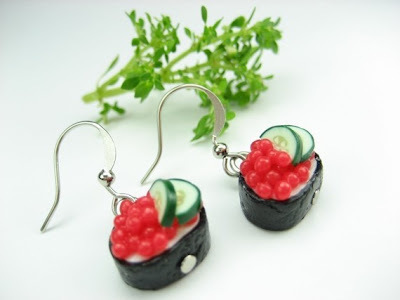 18 Cool and Creative Sushi Inspired Products and Designs. 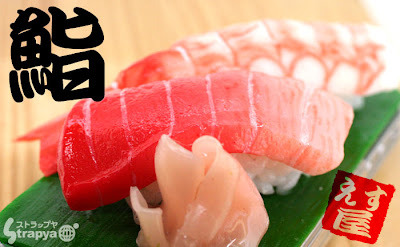 Collection of 'Cool and Creative Sushi Inspired Products and Designs' from all over the world. 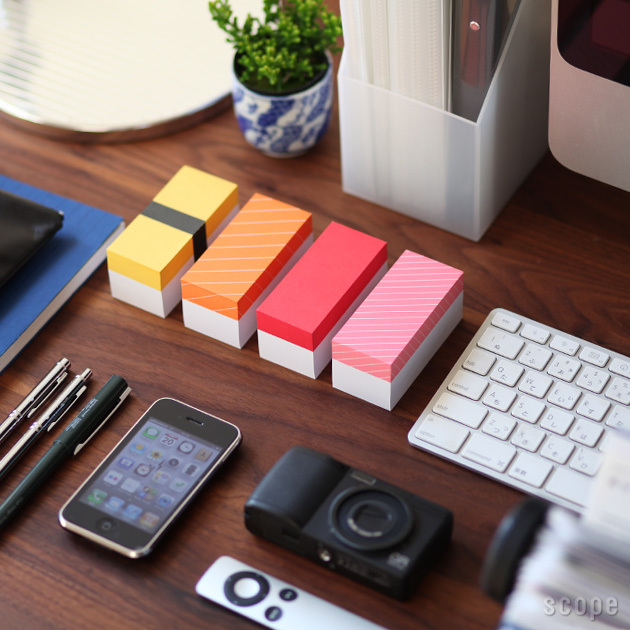 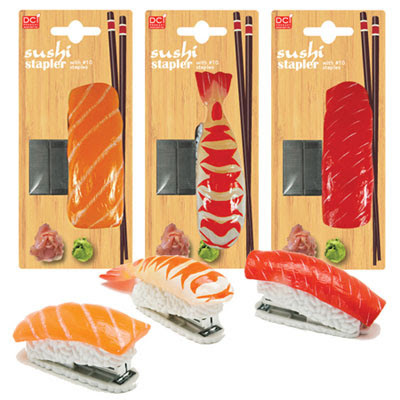 Sushi Staplers: These cool sushi mini staplers come in the shapes of tuna, salmon and shrimp. Sushi Clocks: These cool clocks are handmade and arranged in an actual sushi tray. Sushi Hairpins: Handmade from felt and fleece, so each sushi hairpin is unique. 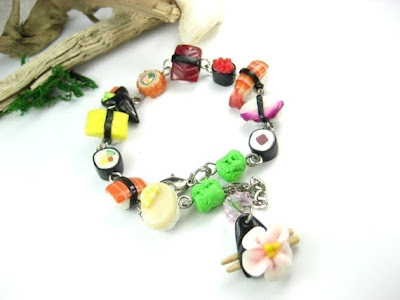 Sushi Bracelet: You enjoy sushi? 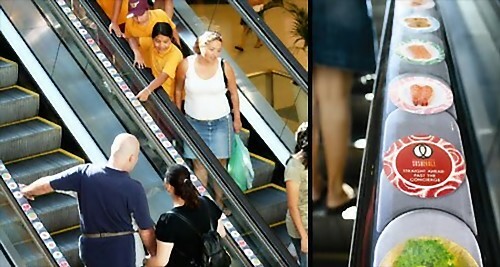 Now you can wear it as a bracelet. Sushi Earrings: Cool handmade earrings that comes in the shape of sushi. 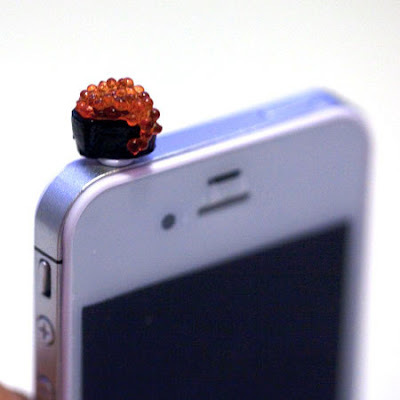 Sushi iPhone Earphone Dust Plug: A cool earphone dust plug for your smartphone, can be placed into a 3.5mm headphone jack. 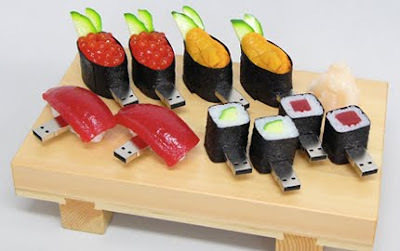 Sushi USB Drives: Who doesn't enjoy sushi? 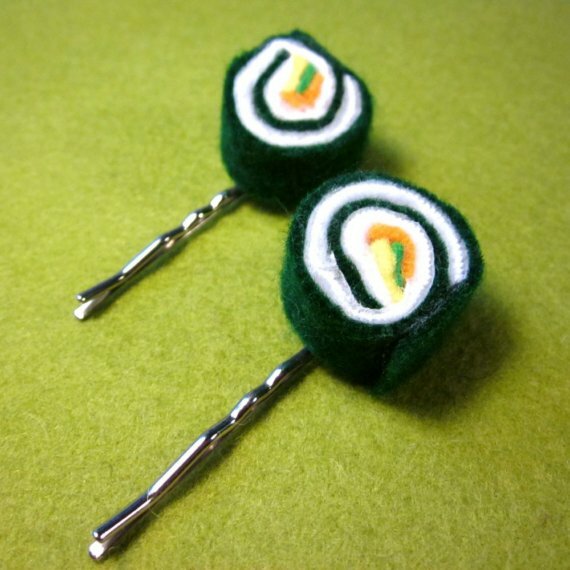 You are sure to like these Sushi USB drives. Sushi Mini Magnets: Cool magnets that comes in the shape of sushi. 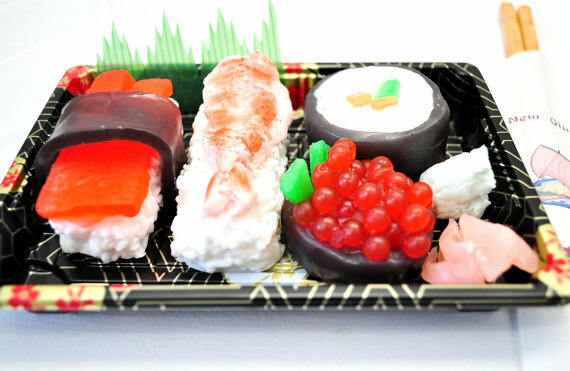 Sushi Soap Set: These look so real and delicious but these are for cleaning. 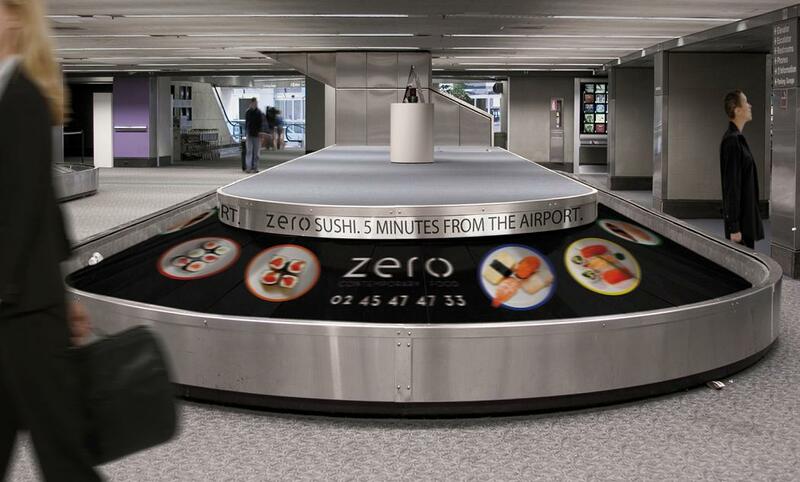 Sushi Inspired Advertisements: Sushi Roll Escalator Advertisement - this one cleverly uses the handrails of the escalator to create a sushi train. 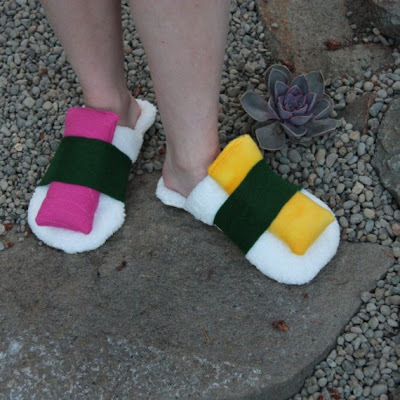 Sushi Slippers: Handmade sushi slippers with the softest, plushest, fleece possible. 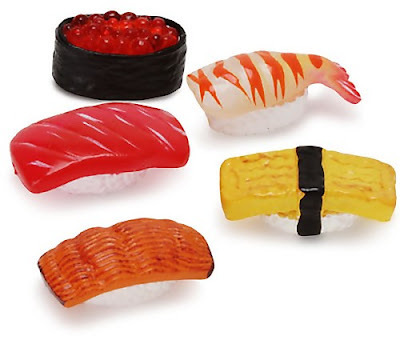 Sushi Pillows: Cool pillow look like oversized pieces of sushi. 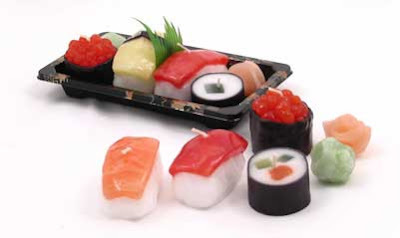 Sushi Candle Set: Each of this sushi candle comes prearranged in its own Japanese "take out" box. 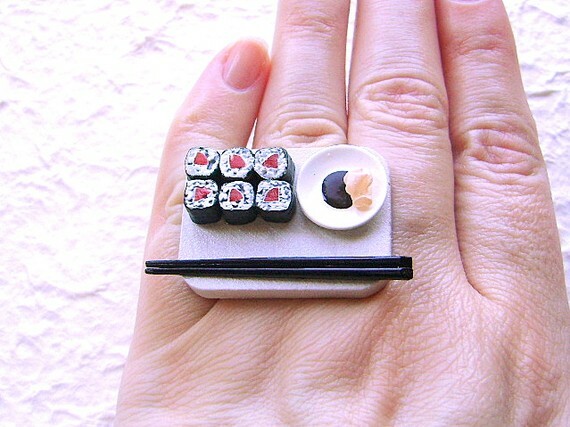 Sushi Ring: These adorable miniature food ring is handmade by Sofia, a Canadian artist living in Japan.